For God Shammgod’s sake, let that picture wash over you! Larry Nance was a ferocious, dynamic, and unstoppable finisher at the rim. You’d have to be brave, insane, or both, to try and stop his forays to the basket. On the fast break he’d catch Mark Price’s lobs or dimes and finish them off right with swooping one-handed sledgehammers and two-handed pile drivers. It’s as if a whirlwind of fury was released on the hardwood of the NBA. And that fury applied on the defensive end as well. In fact, maybe even more so. Nance prided himself on brazenly protecting the rim. He allowed few shots from opponents to go up undetected and undisturbed. 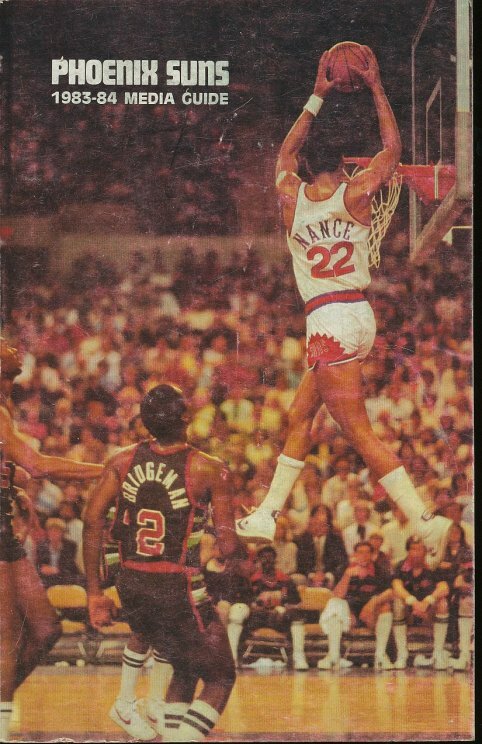 He toiled on a usually underwhelming Phoenix Suns squad for most of the 1980s, which may have prejudiced voters against him, so Nance made only three All-Defensive teams. All of those selections came after he joined a winning ball club in Cleveland. His defense there was just as nasty as it was in the Arizona desert, though. In between Nance certainly had some higher averages than these, but not by much. The big difference, though, is that Nance over the years improved his shot by developing a dependable jumper and his free throw shooting went from liability to beneficial asset. The highwater mark of Nance’s Suns tenure was the 1984 season. Despite going 41-41 during the regular season, the Suns reached the Western Conference Finals. In a six-game defeat to the Los Angeles Lakers, Nance averaged a sterling 21.5 PPG, 10.5 RPG, 1.8 BPG and .602 FG%. And of course, earlier in the year, Nance became the first champion of the NBA’s modern Slam Dunk Contest besting Julius Erving in a spectacular showdown. Nance’s years in Phoenix ultimately proved disappointing for reasons beyond his control (teammates’ cocaine habits), but they nonetheless provided him with experience, wherewithal, and veteran command to lift the Cavaliers when he joined their squad in 1988. His mid-season acquisition sparked a mediocre Cavs team to a 12-4 finish and a playoff berth. Through 1993, the Cavaliers twice finished with a 57-25 record and another season of 54 wins. Unfortunately, they fell victim to a) the Chicago Bulls, b) an awful trade that sent Ron Harper away for Danny Ferry, and c) ill-timed injuries to Mark Price and Brad Daugherty. The Cavaliers’ greatest success in Nance-Daugherty-Price years was the 1992 season where the polished off one of those 57-25 records and ended the last gasp of Larry Bird’s Boston Celtics. In a forgotten, but grueling semi-final series, the Cavs defeated Boston in seven games. Nance was outstanding particularly in the crucial Game 4 of the series, which was on the road in New England. With Boston leading 2-1 in the series, Cleveland was in dire straits and needed overtime to emerge triumphant 114-112 setting the stage for their ultimate series victory. Nance was a decimating force for Cleveland as he put a hurt on the Celtics with 32 points on 13/16 FGs and 6/6 FTs in 49 minutes of play. Unfortunately in the conference finals, the Cavaliers again met their nemesis, the Chicago Bulls. Losing the series in six games, Nance gave it his customary all in the five-point Game 6 loss that ended the series. The long-armed whirlwind provided an all-around masterpiece of 25 points, 16 rebounds, five assists, three blocks, and two steals. Despite the painful futility they experienced in upending the Bulls, those Cavalier teams were wonders to behold. And it was the High Ayatollah of Slamola that kick-started this period of magnificent Cavaliers basketball.